This grand finale of a dessert features maple-burnished pears, drifts of lemony whipped cream and a sprinkling of candied pine nuts. It's all about contrasts--warm and cool, creamy and crunchy, sweet and tart. And best of all, all three components can be made ahead of time. Candied Pine Nuts Line a baking sheet with parchment paper; set aside. In a dry, medium heavy skillet, toast pine nuts over medium-low heat, shaking frequently, until golden and aromatic, about 3 to 5 minutes. Transfer to a dish; set aside. In the same skillet, cook sugar over medium-high heat until sugar begins to melt. Shake pan occasionally, but do not stir. Once sugar begins to melt, reduce heat to low and cook for 5 to 7 minutes or until fully melted and golden brown. Stir in pine nuts. Pour onto prepared baking sheet. Cool completely. Break or chop into small pieces. Store in an airtight container for up to 2 days. Lemon-Cream In a chilled medium bowl, beat lemon curd and sour cream with an electric mixer until just combined. Add whipping cream and vanilla. Beat on medium-high speed for 5 minutes or until mixture is thickened and mounds. Chill, covered, for up to 8 hours. Roasted Pears Preheat oven to 400 degrees . Squeeze lemon into a large bowl half full of cool water. Peel pears, leaving stems, and cut a thin slice off bottoms. (Submerge pears upright in water as you work.) In a saucepan, combine apple juice, maple syrup, brown sugar, butter, cinnamon, cloves and salt. Cook and stir over medium-high heat until butter melts and sugar is dissolved, about 5 minutes. Pat pears dry and arrange upright in a 3-quart baking dish. Pour syrup over pears. Roast for 45 to 50 minutes or until tender and beginning to brown, basting with syrup occasionally. (If syrup thickens too much, add water to pan.) If not serving immediately, pears can sit at room temperature, covered, for up to 3 hours. Rewarm slightly before serving. 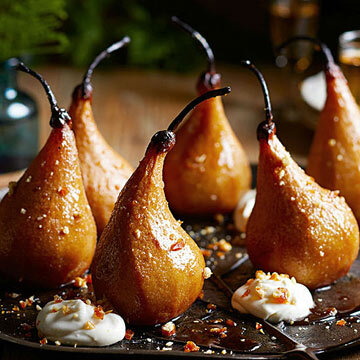 To serve, arrange pears on dessert plates or a platter. Drizzle with some of the syrup. Dollop Lemon Cream around pears. (Gently stir first if necessary.) Sprinkle with Candied Pine Nuts. If desired, pass remaining syrup, cream and nuts.